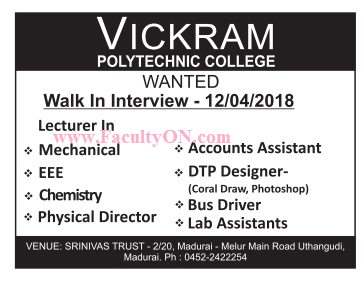 Vickram Polytechnic College, Sivagangai has advertised in the DINAMALAR newspaper for recruitment of Lecturers Plus Non-Faculty jobs vacancies. Interested and eligible job aspirants are requested to walk-in on 12th April 2018. Check out further more details below. About College: Vickram polytechnic College was established in the year 2008 by Srinivas Trust which also runs Vickram College of Engineering and Vickram College of Teacher Education. The college is established and run by Engineers and is pioneer in the field of technical education. The college is situated in the Madurai-Sivagangai highway, about 19 Kms from Madurai, in an area of 30 acres and with a built-up area of 1,10,000 Sqft housing world class laboratories, spacious class rooms, workshops, computer labs and digitalized library. How to Apply: Interested candidates are requested to attend the Walk-in interview along with CV, originals & copies of certificates and recent PP size photo to the walk-in address provided below.